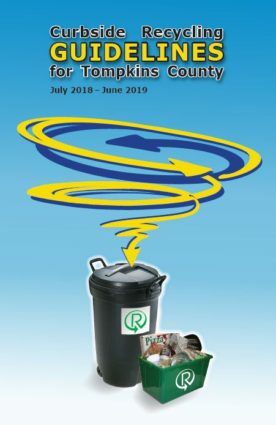 Tompkins County contracts for county-wide curbside recycling on an every other week basis. Click here to find your scheduled collection day. For your convenience, you can include recyclable paper, glass, metal, and plastic containers in one bin. Collect curbside recyclables in a recycling bin at home. Place your recycling bin at the curb for your scheduled collection. Bring your empty recycling bin back inside and continue to collect recyclables. To View or Print Curbside Recycling Guidelines and Pick Up Schedule Click Here. Please note that additional materials, such as appliances with Freon®, batteries, electronics, fluorescent bulbs, household hazardous waste, rigid plastics, plastic bags, scrap metal, textiles, and tires can be recycled at the Recycling & Solid Waste Center, but are not accepted for curbside collection. Permits are required for some materials. Fees may apply. Click here for more information. County curbside recycling bins. Bins are available for sale at the Tompkins County Department of Recycling and Materials Management office. Place recycling bins at the curb on your scheduled collection day with the “R” facing the road so the recycling collector can see it. A container that is no larger than 50 gallons, weighs no more than 40 pounds when full, and is clearly marked with an “R”. This container may have a lid. Place recycling bins at the curb on your scheduled collection day with the “R” facing the road so the recycling collector can see it. “R” decal stickers are available for free at the Recycling and Materials Management Office, the Recycling and Solid Waste Center information kiosk, municipal offices, and most grocery stores. How to Prepare Recycling: Empty all containers, and rinse containers of excess residue. Lids, labels, neck rings and caps on containers are OK.
Flatten all cardboard boxes. Cardboard that does not fit in your recycling bin or container can be placed next to your recycling bin in stacks no larger than 4ft. X 4ft. X 4ft. Do not use plastic bags to collect your recycling, or place recyclables in plastic bags. If your recyclables are picked up on the same day as your trash, place your bin at least 2 feet from the trash so the recycling collector can easily see your bin. Staples in office paper or envelopes are OK.
Improperly prepared recyclables or unacceptable materials will be left in your bin with a note explaining why it was not collected.